We will meet in New Mills (GR-002858) at 09:30 on Hyde Bank Road. The plan is to catch the 10:17 from New Mills Central which arrives in Hope at 10:40. 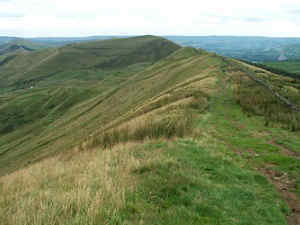 We will then walk back to Edale via Lose Hill, Hollins Cross, Mam Torr and Lord's Seat before (depending upon time) either dropping into the Edale valley and heading to Edale station via Barber Booth; or entering Edale village via Upper Booth and the Pennine way. We will plan to get the 16:47 or the 17:47 from Edale back to New Mills (which may allow time for a refreshment stop in Edale). Parking in New Mills:- From Newtown take the A6015 towards New Mills but at the traffic lights where you would turn left to go to the town centre, go straight on. Take the third significant road on the left just after a church (Church Lane) and follow it downhill to the junction with Hyde Bank Road. Turn right at the T-junction and park immediately on the left (opposite some cottages). There should be plenty of parking spaces all along Hyde Bank Road. Please bring stout walking boots and a packed lunch and let me know if you are planning to join us.